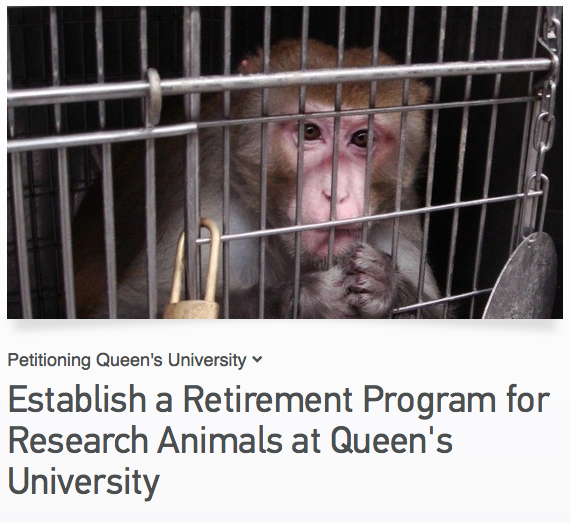 Thousands of animals used in biomedical experiments at Queen’s University are routinely killed upon completion of the research. We believe that these animals are entitled to live out their lives in safety and comfort in loving homes or sanctuaries whenever possible. Homes are available, so all that is needed to make a retirement program a reality is the cooperation of the university administration. The least we can do is to offer them a safe and comfortable home to spend the rest of their days, in the company of caring humans. Our petition has reached more than 1500 signatures. If you have not done it yet, you can sign our online petition here. Animals are the most seriously victimized by invasive experimentation and dissection in research and education. But they’re not the only ones affected. Our new poster campaign highlights the stories of former biomedical researchers, lab technicians, biology students and others who refuse to accept the premise that doing good science necessarily entails harming animals. What knowledge and how many discoveries have been lost due to the exclusion of ethical students and researchers, and the different perspectives they would bring to science? How many resources and how much time have been wasted in the vain pursuit of cures for diseases like cancer and Alzheimer’s in humans using ‘animal models’? Alternative approaches to scientific inquiry have the potential to generate medical breakthroughs, and to attract scientists with a more ethical and holistic conception of the place of humans in the natural world, thereby expanding the horizons and achievements of scientific inquiry. Click here to see the ongoing development of this poster campaign. Do not forget to follow our blog here for more news on our campaigns! And like your Facebook page!